How do I renew my Hawaii architect license? All online renewals must be submitted through “MyPVL”, and renewal postcard reminders have been mailed out. On-time renewals for the licensing period ends midnight on April 30, 2018. 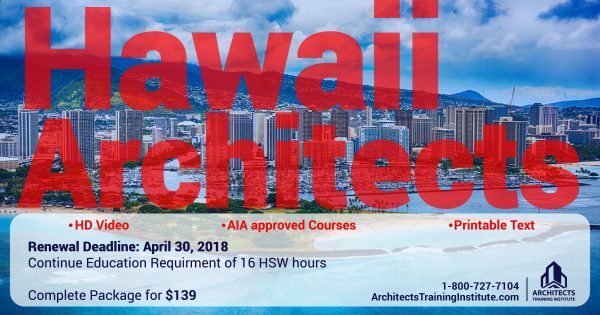 What are Hawaii architect continuing education requirements? Architects in Hawaii are required to complete 16 HSW by April 30th of even-numbered years. AIA members must complete 18 learning unit hours including 12 HSW annually. When is my Hawaii architect license due for renewal? Architect license renewals are due biennially by April 30th of every even-numbered year. Failure to renew by the deadline will result in the forfeiture of your license. A forfeited license may be restored within two years, subject to meeting restoration requirements. Failure to restore a forfeited license within two years will result in the termination of the license. You will be required to apply as a new applicant and meet current licensing requirements. Where do I find classes to renew my Hawaii architect license? Architects Training Institute offers online continuing education to fulfill your state or AIA requirements. Who submits my Hawaii architect continuing education? CE documentation is not required to be submitted with your renewal application but it is the licensee’s responsibility to notify the state. This entry was posted in Architecture and tagged Hawaii Architecture.